Mines has always had a strong culture of innovation, but turning great ideas into successful businesses hasn’t always been a well-known focus of the university. Today, however—thanks to a revamped entrepreneurial and innovation emphasis on campus and a new alumni interest group—that’s starting to change. Earlier this year, Mines created a new Center for Entrepreneurship and Innovation to better define and prioritize an inventive and enterprising environment on campus while providing better business connections for students and alumni. But Mines President Paul C. Johnson recognized there was additional alumni potential, with a readily available group who wanted to contribute their talents and skills to bolster Mines’ efforts in these areas. As a challenge from President Johnson, the Entrepreneurship and Innovation interest group was formed to get Mines graduates to view technology innovations through a business lens, to bring the campus and alumni communities together and to find new ways to add value to the world. Many alumni, including Stu Bennett ’66, eagerly volunteered. “We started working with faculty, staff and people in the community involved in the culture of entrepreneurship,” he said. Out of these discussions, the interest group was off the ground. Today more than 20 people have joined the interest group and are creating an expanding network of business experts—some of whom are Mines graduates themselves—to help alumni turn bright ideas into potential moneymaking ventures. “We have volunteers lined up: patent attorneys, angel investors, a startup accelerator, business brokers, accountants, corporate planners. It’s all the talent you need to put a business together,” Bennett said. The goal is to invite experts to give seminars and meet with individual alumni for in-depth discussions and business planning sessions. This can include everything from teaching a short-term business course to creating a pro forma statement for projecting financial results. The school’s new Center for Entrepreneurship and Innovation has provided media facilities where interest group experts will create videos explaining business incubators, angel investors and the essentials of making a business case for an idea. The videos will be available on the center’s website, helping to spread the word about the group and assist people outside the Golden area. The interest group works with companies that support startups, including Traxion, a startup accelerator in Golden that works with innovative companies in the science and technology sectors. “We’re an off-campus resource. We help bring real-world components to the world-class engineering and technical education that Mines provides,” said Traxion partner Bud Rockhill. The company helps alumni develop and analyze business plans. It also connects startup companies with alumni who don’t want to start their own business but are interested in helping a startup. “Instead of feeling like you have to invent something, you can join a team to accelerate the growth of an existing startup,” Rockhill said. Traxion also works with Mines students. This spring, the Traxion partners advised student teams competing in an entrepreneurship challenge sponsored by Newmont Mining, holding weekly classes condensed from its program for real-world startups. The students were taught how to reach out to industry experts and potential customers for feedback on the feasibility and pricing of their ideas. As a result, some teams modified their ideas to better meet the needs of potential customers and companies—something many entrepreneurs fail to do, Rockhill said. “A lot of well-intentioned people fall in love with their own ideas and don’t ask customers about them until after they’ve built something nobody wants,” he said. To keep abreast of the burgeoning interest in entrepreneurship at the school, the alumni interest group works with Kevin Moore, dean of Mines’ College of Engineering and Computational Sciences and the academic leadership representative for the interest group. Responding to comments from students who wanted spaces and tools to develop their ideas, Moore worked with the university to create the Blaster Design Factory and other spaces, where students can do low-level prototyping or other specialty work. Moore has also helped find corporate sponsors for student competitions. Mines also made updates to the curriculum, providing entrepreneurship classes that were listed in the catalog but hadn’t been taught in at least a dozen years, Moore said. With the opening of the Center for Entrepreneurship and Innovation, the entrepreneurial momentum is bound to accelerate. Despite the strides they have already made, the interest group seeks more alumni participation in its growing network of experts. The Entrepreneurship and Innovation group is one of several new alumni interest groups that were formed following the Office of Alumni Relations’ switch to a free membership model. With many more connected alumni, it made sense to develop interest groups. “Entrepreneurship and Innovation is one of the stronger groups we’ve currently got going,” said Damian Friend, who, as the alumni association’s executive director, helps the groups develop templates for goals, programming and budgeting. Each group is overseen by an alumni board member and a Mines faculty member. Friend helps them create individual charters. The Entrepreneurship and Innovation group meets monthly and will hold lectures and panel discussions that both alumni and students can attend. “There’s a lot of free-flowing ideas and information,” Friend said. The interest group fills a need for graduates who may become entrepreneurs someday, even if that wasn’t part of their original plan. Bennett, who opened a dental practice after working as a chemical engineer for several years, said he could have used the group’s help himself if it had been available. “I had no idea how to start a business,” he said. Do you have an intriguing technology idea that you’re not sure how to develop? The Entrepreneurship and Innovation alumni interest group may be able to help. Its expert advisors can help you develop a business plan and vet your idea for feasibility, making sure you’re on the right track before you invest your time and money. Maybe you don’t have an idea, but would like to participate in the exciting world of startups. If you have expertise to share or just want to get involved, the interest group world love to talk to you. And if you’re too busy to get involved right now, you can help by spreading the word. You don’t have to be a Mines graduate to join the alumni association or its interest groups. Mines family members, friends and community members are all welcome. 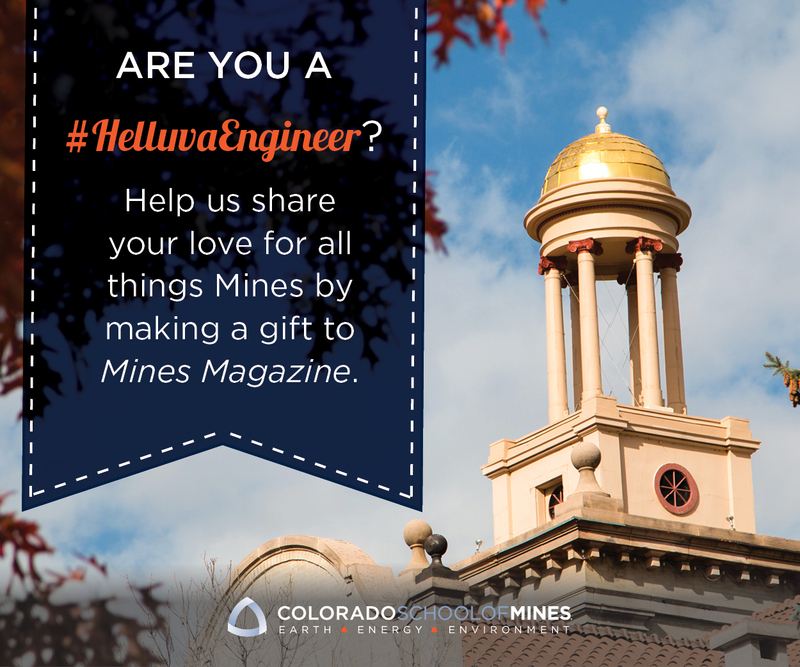 For more information or to get in touch, visit minesalumni.com. Check out the other available alumni interest groups here.